Sehr schönes Hostel. Die Zimmer sind sehr groß und haben extra Vorhänge für mehr Privatsphäre zwischen den Betten. Die Zimmer /Bad/Gemeinschaftraum waren sauber. Hostel Mitte liegt sehr zentral in der Altstadt und ist perfekt um Brünn zu erkunden. Die Cafebar im Erdgeschoss serviert super Kaffee :) gerne wieder! I certainly enjoyed my stay here. 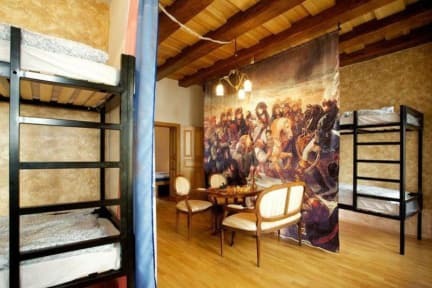 They're just expanding their rooms, I stayed in a very new room, which was more a own apartment than a hostel. Small kitchen facilities in the room. Everything very clean and new. Beautiful antique furniture! A little more equipment in the kitchen would be nice. I'd also suggest additional drawers as storage room under the beds, makes it easier when travelling with a backpack. Enjoyed the calmness, though it's not the typical hostel atmosphere to socialize. The rooms are beautiful, with tables, chairs, lockers, and even curtains for more privacy! Every room has it's own spacious bathroom and it's very clean everywhere. The kitchen/common room is well equipped and very cosy, as well as the little café downstairs. As everything is pretty small, you don't meet many people, it's definitely no party hostel. The hostel is situated in the centre of brno, so be aware that it's quite noisy at night. Could not be situated any better. One of the better hostel breakfasts, nice rooms, beds/mattresses could be better, but did not bother me too much. Water in the sinks is too weak. Beste Lage des Hostels. Sehr freundliche Mitarbeiter. Im Erdgeschoss ist das hosteleigene Café, was auch sehr zu empfehlen ist. Frühstücken kann man von 08-10 Uhr im Dachgeschoss an einem großen Tisch und kommt dort schnell ins Gespräch mit anderen Hotelgästen, die nicht im eigenen Zimmer sind. 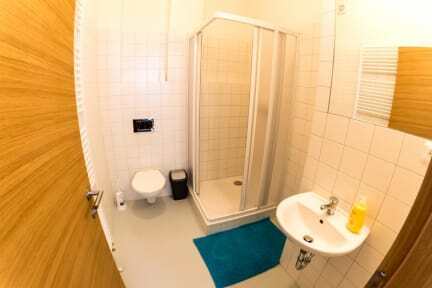 Die Zimmer sind individuell eingerichtet und haben ein eigenes Bad. Vor jedem Stockbett kann man einen Vorhang zuziehen und es gibt auch kleine Spinde. Auf jeden Fall Brno nicht nur für 1 Nacht. Positive: central,clean,despite very thin walls could sleep very well with earplugs. Bed was comfy. Maps handed out at reception useful. Negative: if you don't offer an inclusive breakfast but offer guests a discounted breakfast elsewhere,please have up-to-date information on their opening times! I was told i could go there from 8am, paid in advance and was told on arrival they didn't open till 10am! I was refunded but it took 30mins of my time away when i didn't have much to spare!